This piece originally appeared in Forbes.com. 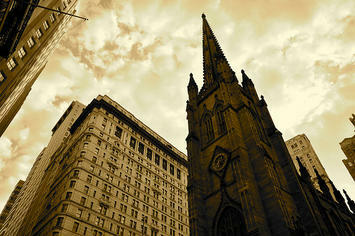 Church near Wall Street photo by Flickr user Roger Schultz. Submitted by ahmed on Mon, 05/06/2013 - 02:38. Submitted by nectarclaims on Thu, 11/14/2013 - 03:15. Submitted by polidem on Sun, 04/28/2013 - 22:56. Submitted by nik21 on Fri, 03/15/2013 - 01:20. Submitted by MALINGA on Wed, 01/02/2013 - 02:54. This post is very simple to express and understand without leaving any details out. Great work! Pacoima Garage Door Repair It's late finding this thing. At least, it's a thing to be familiar with that there are such events exist. Submitted by garrish27 on Mon, 06/08/2015 - 00:58. Submitted by shagor on Fri, 01/18/2013 - 10:20. Submitted by naqash899 on Thu, 12/27/2012 - 07:07. I can not agree with it any more to Mobile phone conclusion here.i am very happy to see your blog. i like this kind of blog. i am regular visitor of your site. i like this kind of blog. Submitted by rtreep on Tue, 04/10/2012 - 23:14. The rise of secularism has interesting implications for suburbs. In the south for the last 30 years, no planned communities to my knowledge ever included land use for sacred space. It simply isn't part of a developer's land use plan. Religious facilities generally get built on little leftover pockets of space, on existing campuses, or within repurposed retail space. All of which are B locations. Meanwhile, A-location churches in the older urban centers are experiencing somewhat of a renaissance, with remodeling and expansion happening. Affluent members can foot the bill for this. The church-planting movement acknowledges that their effort to create new Christian-based worship houses amounts to treading water: for each new church "planted," another one closes up. This might be worth a bit closer look to find a trendline that could prove interesting. Religious institutions may be suffering at the hands of economic institutions, but they shouldn't be counted out just yet. Submitted by naqash899 on Mon, 11/05/2012 - 00:29. There is nothing more rewarding than working with an Aktion Club. My husband and i look forward to attending their meetings and going to the Aktion Club convention with them.